How many eggs does a bald eagle lay? 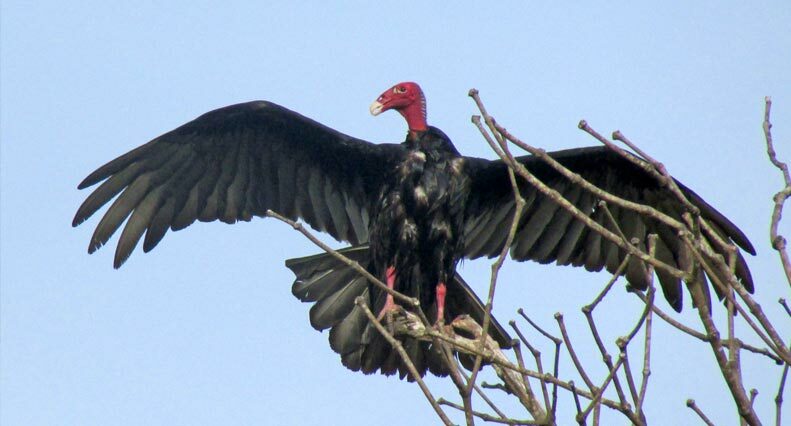 Where do turkey vultures go for the winter? 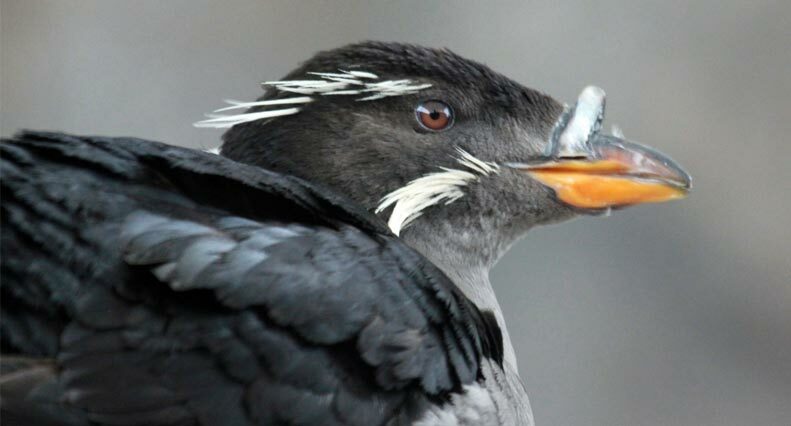 What type of bird is the best swimmer, and what the heck is a horned Rhinoceros Auklet? The iconic Bald Eagle is a success story in our area with the Pacific northeast population recently being removed from the Endangered Species List. The species is not out of the woods yet, but population increases are promising. Adult Bald Eagles have brown bodies with white heads and tails. Bright yellow feet and a yellow beak can been seen from quite a distance away. 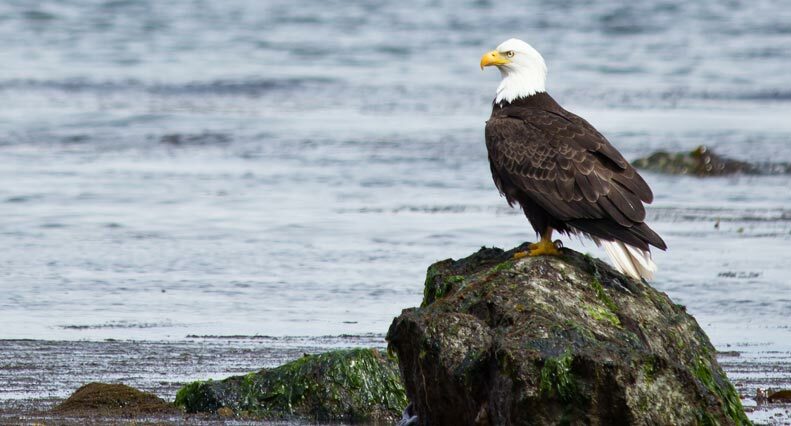 Several Bald Eagle pairs can be found all year off the coast of Southern Vancouver Island. These pairs mate for life and are faithful to their nesting site. Bald Eagles will add sticks to their nest each year, making their nests the largest of any bird in the world. Bald Eagles lay 1 to 3 eggs, but in most situations only 1 or 2 chicks survive to reach the flying stage of life. They need large, tall trees to build their nests in, and prefer a view of the water. Their diet mainly consists of fish and carrion. Tufted Puffins are interesting looking birds with black bodies, white faces, and yellow feather tufts extending from the top of their heads. Adding to their striking appearance is their bright orange bill. 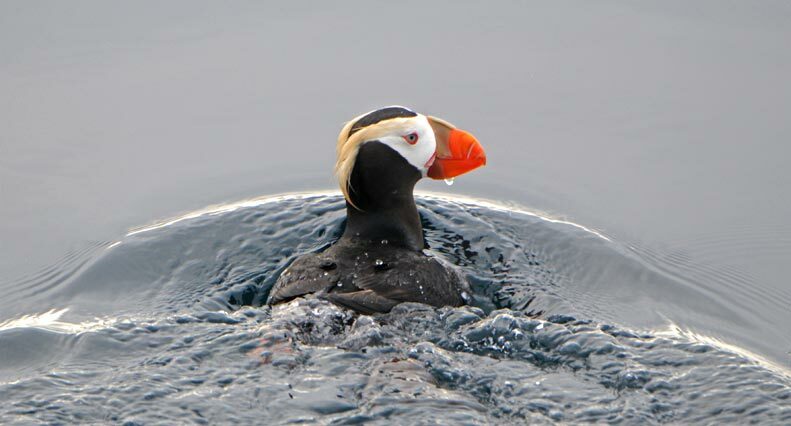 Tufted Puffins are rare in the Strait of Juan de Fuca, having specific nesting sites on remote islands. They prefer rocky areas with some grass cover, where they lay their eggs in burrows safe from predators. 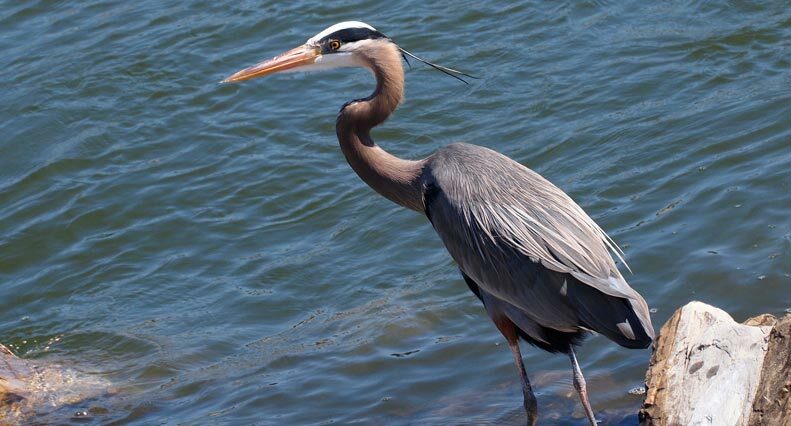 Great Blue Herons are very large birds with long legs for wading in the water to search for food. They will prey on frogs, fish and crabs. They are easily identified by their gray- blue wings, white bodies, and long, pale yellow bills. Great Blue Herons also sport a tuft of black feathers on their heads making them punk rock stars of the bird family. These tall birds nest in trees, having a rookery at Beacon Hill Park in Victoria. They are year round residents in our area. Turkey Vultures can be seen around Victoria from April until October using thermals to glide through the air. They are easy to pick out with their large, two-toned wings (black and light gray), and their featherless red heads. Turkey vultures have an excellent sense of smell which they use to find carrion on land. They will head south to California and Mexico for the winter months. Brandtʼs Cormorants are black bodied birds with long, slender necks. During mating season in the spring, they have blue throats. These cormorants do not have water- proof oils in their feathers which allows them to dive deeper and be more agile swimmers underwater. Brandtʼs Cormorants are often seen standing on the rocks with their wings extended out to dry. 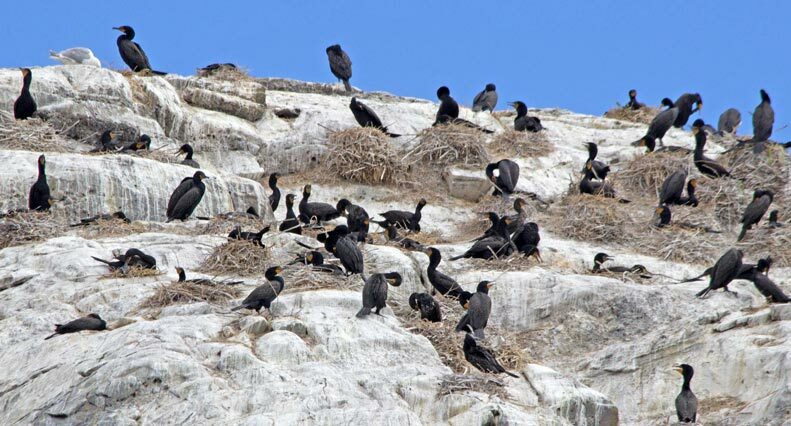 Chain Islands which are located just off Oak Bay in Victoria are home to 2% of the worldʼs population of Brandtʼs Cormorants. 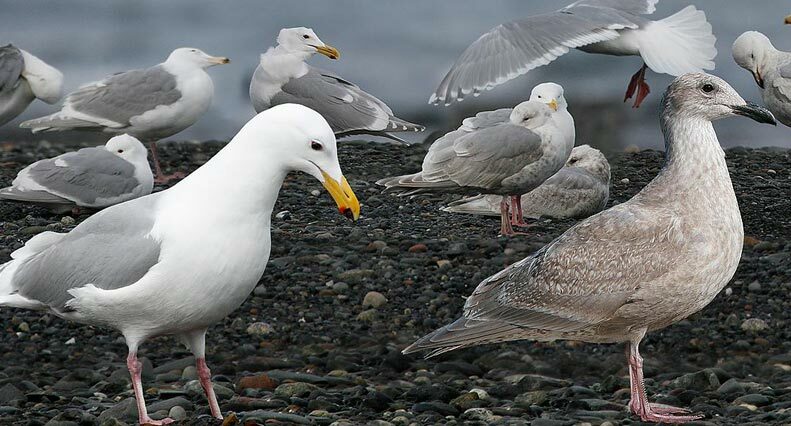 Glaucous-winged gulls are the most common type of gull on British Columbiaʼs coastline. The largest population in the province resides on Chain Islands, a grouping of over 18 small islands in the Strait of Juan de Fuca. They have a large bill and grey-tipped wings. These gulls can be seen in the area year round. 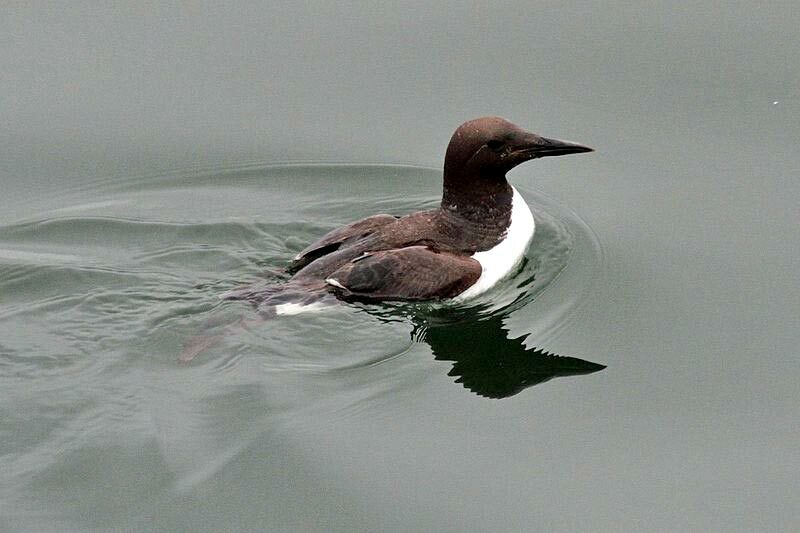 Common murres are small, stocky diving seabirds. They are black on top and white on the bottom. They are better at ʻflyingʼ in the water than they are in the air, diving to great depths to catch fish. Common Murres are true seabirds, only going on shore to breed and nest. They are very fast flyers when they do get off the water after a lengthy run along the surface. Pigeon Guillemots are often confused with the larger Common Murre. They have a solid black body with an oval white patch on their wing. They are easy to identify if they expose their bright red feet. Pigeon Guillemots dive deep into the water to catch fish, being very graceful and agile swimmers. When they are in flight, they can fly faster than our boat when it is going 30 nautical miles an hour! Rhinoceros Auklets are a small, dark brown seabird, with 2 white stripes on its head. They are common year round in the Victoria area. 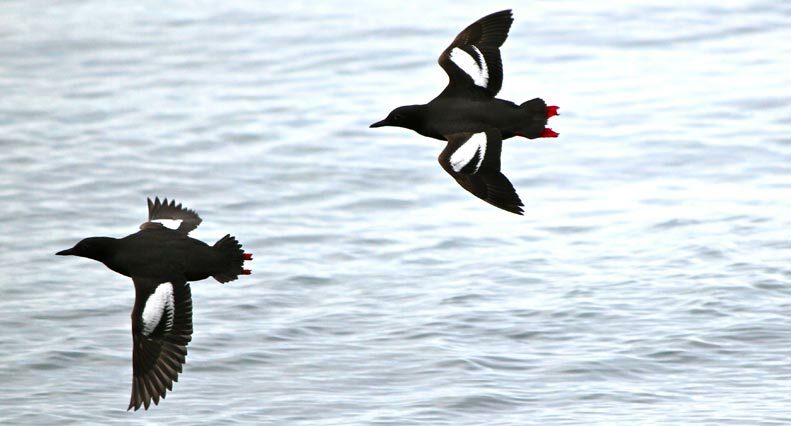 The most interesting characteristic of Rhinoceros Auklets is their horn that grows on their bill during the breeding season in both males and females. The horn will eventually fall off when mating is finished for the year. 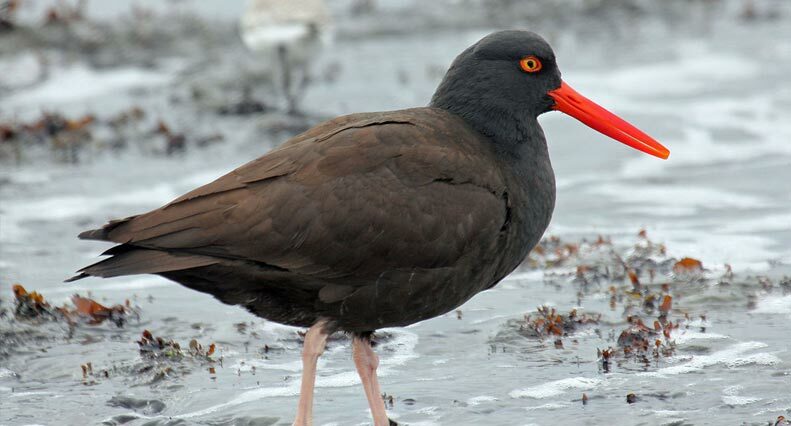 Black Oyster Catchers are similar in size to a crow, also having black bodies, but with light coloured legs and long, red beaks. Their yellow eyes are ringed with red feathers giving them an almost sinister look. The call of Oyster Catchers is unmistakable, sounding like a high-pitched laugh or scream. They live on rocky islands or shorelines, feeding on limpets and mussels, but not on oysters like their name suggests. They are a long-lived species, living to over 30 years of age.